Darren Clarke expects his Champions Club at Moyvalley to present a stiff test when it hosts the fifth edition of the Challenge of Ireland from June 11-14. But joining the luxury Co Kildare club now costs just €10,000 for a preference share - a serious drop on the €75,000 joining fee that was announced at the opening in October 2006. No green fees were to be allowed at the 7,368-yard parkland layout, which was to be reserved exclusively for its members, their guests and residents of the five-star hotel. Now it costs just €50 to play midweek and only €60 at weekends. Millionaire businessman Alastair Jackson, who has invested €100m in the project, suffered more pain last year when he was ordered to pay his former Director of Golf, the ex tour star and Walker Cup player John McHenry, €1.05 million in unpaid consultancy fees. Mr Justice Peter Kelly yesterday granted judgment in that amount to McHenry Golf Ltd, a firm set up by Mr McHenry, a former K Club director of golf, against Mr Jackson and his firms, Eassda Group Ltd and Eassda Ireland. The judge refused to put a stay on payment. The defendants' counsel indicated they may bring a claim against McHenry Golf. Mr McHenry claimed he was retained under a contract of January 2007 by Eassda involving setting up and running a luxurious golf facility at Moyvalley, Co Kildare, which opened last year. He had received the first €200,000 instalment of a €1 million non-refundable retainer to be paid over two years, with €250,000 a year for consultancy services in years one to three of the five-year arrangement. He had received just €200,000 of the retainer, plus payments for consultancy services for the period up to October 2007. It had become apparent there were difficulties with the concept of a super-exclusive golf club, he said. After payments were not met, Mr McHenry said he instructed solicitors. A settlement was reached in November 2007 between lawyers under which the defendants were to pay €1.25 million in instalments at set times. Mr McHenry said the first payment of €200,000 was made by December 15th, 2007, but Mr Jackson had later told him he would not be paying the second stage payment. Mr McHenry said €1.05 million was now due. The defendants, particularly Mr Jackson, were reputed to have a €700 million fortune, he added. The annual subscription was €5,000 just over two years ago, but has since dropped to €1,250 due to tough competition and the economic downturn. Clarke and his manager Chubby Chandler dreamed of copying the model set by the ultra-exclusive Queenwood club in London, where he is also a member, by making Moyvalley one of a handful of exclusively branded Champions Clubs around the globe. "I am am member of a private golf club in London called Queenwood and that has done unbelievably well so we want to have a collection of five or six star properties around the world," Clarke said at the opening in October 2006. "It is all about the quality of the golf course, the service that you get when you arrive into the club and having your every whim looked after. I am very proud and pleased that this is the first one here at home." The demand simply wasn't there, however, and Moyvalley has been forced to start at the bottom by taking on a Challenge Tour event to boost its profile. Green fees by member of the public are now eagerly sought with a round costing just €50 midweek and €60 at weekends. The arrival of the Challenge Tour gives the venue a glimmer of hope at a time when Irish courses are losing revenue. Since its inception, the Challenge of Ireland has played an integral role in the development of some of the host nation’s emerging talent. In the 2007 Challenge of Ireland presented by Glasson, Gareth Maybin played as a sponsors’ invitation and was the highest home finisher in 15thposition. The young Ulsterman subsequently went on to record three top ten finishes en route to 49th place in the final Rankings, thereby securing full playing privileges on the Challenge Tour last season, when he finished fourth to ensure his place in The Race to Dubai. The 28 year old has since proved his credentials with a remarkable start to his maiden European Tour campaign, losing out to Richard Sterne in a play-off at the South African Open Championship on only his fourth appearance of the season. Maybin’s compatriot Gareth Shaw will hope to follow a similar path, having finished in a tie for fourth in the 2008 Challenge of Ireland presented by Glasson – his first event as a professional – en route to securing category 11 status for the 2009 Challenge Tour Schedule. Oliver Brady always had an eye for a winner and in what turned out to be one of his final deals before his death last September, the late businessman and racehorse owner may well have found one. The Challenge of Ireland will take place at the €100 m Kildare complex from June 11-14 after two years at Glasson in Athlone. European Tour champions and 2001 Walker Cup teammates Michael Hoey and Graeme McDowell have both backed the Challenge of Ireland ahead of the fifth edition of the event, which for the first time will be played at Moyvalley Hotel & Golf Resort in Kildare, Ireland, from June 11-14. 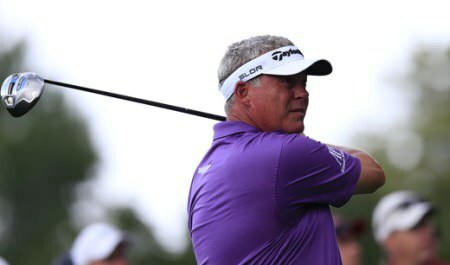 Darren Clarke at this year’s US PGA. Picture: Eoin Clarke www.golffile.ieStarting again at 45 is tough enough for a major winner like Darren Clarke. But it’s going to an even steeper climb for Cork’s John McHenry as he bids to qualify for the Champions Tour.